Before you ask yourself, “Les, are you losing you marbles, you don’t know what a Merlin is”? The answer is no, I’m not losing my marbles. I’m not talking about the raptor which is a member of the Falcon family. However ask yourself this. You have a friend or relative who asks you to help them identify a certain bird that they recently saw. They know you to be knowledgeable with birds, so they’re relying on you to make a quick ID with the clues they’re going to give you. Now if this was me, the first thing I’ll ask, as well as 99% of all birders will be, what color was the bird. That’s what “Merlin” is all about. If you’ve ever visited the web site called “All About Birds” which is through The Cornell Lab of Ornithology, you’ve might already be familiar with Merlin. Merlin is a bird identification tool which uses real life birders like you and me to help people better identify birds. To help the good people at Cornell out they have devised a bird color challenge, which they encourage everyone to try. I could into greater detail, but don’t you think it would be fun to try yourself. So here’s the link and have fun and help out a wonderful idea become reality. The morning started cool and calm as I left my local Kroger’s with a sack of circular pastries, on my way to the park-n-ride in Miamitown. With my official declaration to the end of the Summer doldrums, I was looking forward to a much needed organized field trip. Target species for the day. Wading/Shore birds. First stop for the day was going to be Lost Bridge, however the we made a small detour to the boat ramp at Shawnee Lookout Park, so people could use the facility, and do a little birding at the same time. This place has a reputation for some hot warbler action in the Spring. And with warblers already showing up in good number lately, why not give it a try. There was a couple there already that spotted a few, however our group didn’t have any luck. Now it’s back to the bird-mobile for the couple mile drive to Lost Bridge. We had a good size group with us today. Not too big or too little, just right. 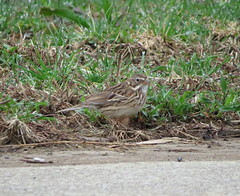 I believe all told, we had about 15 birders total. The upstream side was the hot side with good mudflats with lots of wading birds. This area of mudflats are about the average size I’ve seen in the past. Unfortunately being this far away you’re not able to see any of the birds feeding down there. On the down stream of the bridge I noticed a Green Heron fly in and land on a mud flat right under the bridge practically. It was feeding right along the edge and saw it a couple of time come away with a small fish. Lost Bridge had the most activity, and it seemed like the people were reluctant to go. However after some prodding we gave it up and made our way back to our cars for our next leg of the journey. The Oxbow. We didn’t stay too long here. maybe an hour at the most. We basically meet up at the parking lot, where we left together and drove back a parked by one of the larger lakes, (The name escapes me). However we did pick up a couple new birds for the day count like this Black-crowned Night Heron. After we left The Oxbow, we made our way to Fernald Preserve, where we ended our day. We stacked out Lodge Pond for a little while, and came away with a couple of Short-billed Dowitchers. And I swore I saw a Stilt Sandpiper, as did someone else, however never rediscovering it again I crossed it off my list. The same could be said about this mystery peep at Lost Bridge. At first they thought it was a White-rumped Sandpiper. However when it was standing side by side with another sandpiper, it became obvious that it wasn’t. However I thought it might be a Western Sandpiper. The bill looked longer and slightly down-turned, however that was poo-pooed by the group leader and lumped into the Semipalmated Sandpiper group. I hate leaving doubt in my mind. It was great to be out birding with a large group with wonderful weather to boot. With several more opportunities for group outings coming up, I’m kind of indecisive on which to attend, so stay tuned and find out. Hey, are we there yet. It’s seems like a long time since I went birding. The last time was when I journeyed to Hide-A-Way Hills to catch a glimpse of the Mississippi Kite. Since then I’ve helped my oldest son moved back to college, and I visited my daughter in Michigan. So tonight was the night that I get some evening birding in at the newly re-opened Gilmore MetroPark. There’s 2 entrances into the park. One is on Gilmore Road and the other is off Symmes Road. This is the one I choose due to the location of some ponds I needed to check out. Only having been here once before, I’ve been studying the park map and the satellite views from Google and Bing. Following a maintenance road back into the park the trail left the gravel road and headed further into the park. I knew I was getting close to water when I heard Mallards off in the distance. Heading in the general direction I found a small stream that lead to Cattail Marsh, the largest body of water found in the park. Getting to this location was no easy task. It took a lot of crunching under foot to get to this exact spot. And in doing so I must have spooked 30+ Great Blue Herons. I believe it’s the most I’ve ever seen in one spot. It almost leads one to believe that there is a rookery here someplace. I caught this one resting in a tree. With limited time on my hand, and a setting sun I wanted to find this small observation deck to get a better view of the lake/marsh. Well, as you can tell by the next picture that since the park has been closed some of the vegetation has gotten out of hand. The Silver Maples have absolutely taken over around the edge of the lake/marsh. Getting through this stuff was quite a challenge, especially with a tripod and scope in tow. You should see the lake from this vantage point. However when I finally muscled my way through the thicket of saplings, I was offered this good view of the lake. Settling into the soft ground I started to scan for shore birds. It was a beautiful evening and from where I stood I had good views of the lake. It was pretty obvious that the water level has receded, and the creation of some substantial mudflats will hopefully lead to great shorebird viewing. A real long shot at a Great Blue Heron with a few Mallards. As the evening wore on, and dusk started to fall in around me, a large flock of Great Blue Herons took flight. Grabbing for my camera I was able to get a quick shot off of a small portion of the birds as they flew over the lake. I could have stayed there for hours watching the wildlife. 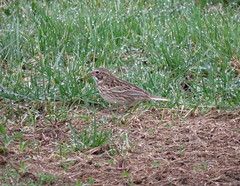 The potential for great birding is self evident from the onset of my visit. The fact that this park has been literally left dormant for several years has created a small oasis where wildlife has been left alone to do what wildlife does. Living within close proximity to Gilmore Ponds will only lead to repeat visits. Right now it’s a diamond in the rough, with tall , thick vegetation on both sides of mowed paths. Since I’ve not been to the West entrance side of the park, I can’t speak on the condition for this area. With the mosquito level rising, and the light level lowering, I said good-bye to Gilmore Ponds with a parting sunset picture. Description: 7 1/2″ (19cm) In breeding plumage the male is a brilliant scarlet with black wings and tail. In non-breeding plumage, female and male are olive green, except the male whose wings and tail remain black. Habitat: Mainly mature woodlands, especially Oak and Pine. Nesting: 3 or 4 brown-spotted greenish eggs in a shallow nest of twigs and stems. Lined with grass and placed on a horizontal branch. FYI’S: This bird could be difficult to spot as it forages for food slowly through the dense foliage high in the forest canopy. During the Summer the male will start to show a patchwork plumage of red and green as they start to undergo the start of the molt. 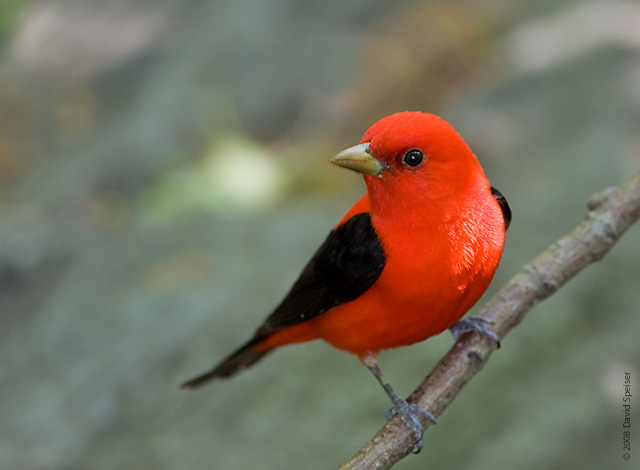 The first Scarlet Tanagers start arriving in the Southern counties during Spring migration by about the 3rd week in April, and along Lake Erie by the first week in May. 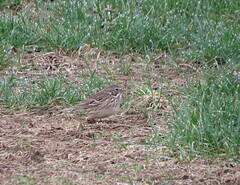 Most will depart during fall migration by the end of September and the beginning of October. Male Scarlet Tanagers are easy to spot if the male continues to sing. Once the singing ceases, which is usually by the first half of July, they become very inconspicuous. I knew that Gilmore Ponds was to re-open this Summer. I’ve been waiting for this moment for some time. So how did it slip my mind? I don’t know, but I’m grateful for Mike Busam, local birder, to post from there after visiting a couple of times this week. Re-named Gilmore MetroPark, I owe this park a good all day visit. Mike has reported some very good habitat for wading birds. Unfortunately what he did discover was an abundance of Silver Maples growing around some of the ponds which will make viewing difficult. This 268 acre park is a must see for any birder in the Tri-State area, and we need to make sure if we do visit, that we have a Butler County MetroPark pass. I’ve only visited the park once, while it was closed, and I felt uncomfortable about what I thought was sneaking onto private property. So I never went back and really discovered it’s secrets. So now with a spring in my step, a map in hand, and a pass hanging from my rear view mirror, hopefully my next outing will be Gilmore MetroPark. So stay tuned for more.